San Diego is an excellent place to visit in January, especially if you live in an area where you want to get away from cold, snowy weather and dreary, gray skies. California's southernmost big city boasts January weather that's almost like a dream, with moderate temperatures and clear skies. And in January, the number of tourists in town drops to half of its mid-summer level, leaving you plenty of room no matter where you go. On the downside, it might rain in January. You can read more about that below. January is right in the middle of San Diego's rainy season, bringing the most unpredictable weather of the year. Monthly rainfall often comes all on the same day, especially during winter storms. 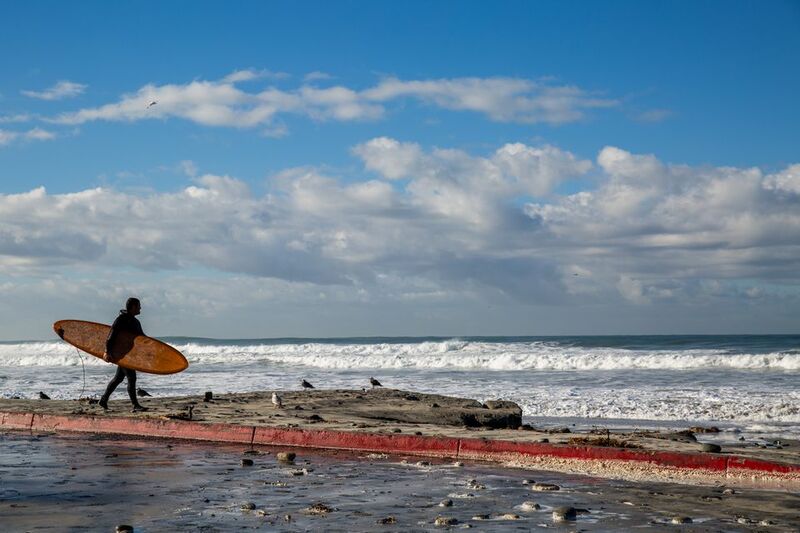 If precipitation happens, try these things to do on a rainy day in San Diego. If you want to compare these weather conditions to what San Diego is like the rest of the year, you can find that all in one place in the guide to typical San Diego weather. And you can get more info to help you decide whether to visit in January by checking the pros and cons of going to San Diego in the winter. Pack an umbrella or rain jacket with hood for rainy days and a warm jacket if no rain is predicted. Bring long-sleeved shirts and sweaters in layers work best and a scarf. Locals are causal dressers, wearing shorts, t-shirts and yoga pants any time they can, so pack those to blend in. Pack flip-flops for the beach but closed-toed warmer shoes for walking around town in case it's wet and cold. Bring party dresses, fancy shoes, and whatever else you might wear for a night out on the town in the Gaslamp district. Pack flat-soled shoes if you plan to visit the USS Midway. They'll make your visit much safer. If you plan to go across the border into Tijuana, take your passport. You won't get back home without it. Restaurant Week: January is a great month to sample some of the city's best restaurants during this annual event, which features special tasting menus and prices. Polar Bear Swim: If jumping into the Pacific Ocean in January is your idea of fun, you can join the other shivering swimmers at the La Jolla Swim Club. Farmers Insurance Open Golf Tournament: Some of the biggest names in golf play on the course in Torrey Pines. San Diego Brew Festival: San Diego is well known as a city with lots of craft breweries, and this event celebrates them all, along with some international craft beers. San Diego’s most popular food trucks will be there too, and you can also enjoy some good music. San Diego Whale Watching: The whale watching season in San Diego runs from December through March. To learn more about California whale-watching and San Diego excursions use the San Diego whale watching guide. A few large conventions happen in San Diego in January. They bring lots of people into town, filling up hotels and raising rates, especially downtown. If you want to avoid them, check their dates on the San Diego Convention Center website.